Rice cookers are one of the most useful kitchen appliances nowadays. The simple fact that they can quickly and easily cook a number of grains like rice and wheat berries and that some even come with special features and settings, makes them a very worthwhile investment. That said, we’ll be talking about the best Zojirushi rice cookers from Zojirushi, a Japanese manufacturing company known for a number of products including electric water boilers, dispensers, vacuum flasks, and more. Coming in at a close second, the Neuro Fuzzy cooker allows you to cook rice perfectly and consistently every single time. It’s very easy to clean; the digital clock it has on display is certainly handy, and it’s very easy to use. It’s a bit pricier than the Micom although it has a larger capacity to make up for it. Designed for those who are on a budget, this 6-cup rice cooker is simple yet highly functional. It doesn’t come with those fancy buttons that are present in most rice cookers in the list. However, it can surely get the rice cooking job done. If simplicity and affordability are what you’re after, then this is no doubt a worthy investment. It uses the induction heating technology which is rather quite useful compared to the traditional rice cooking method. It can also cook brown rice, germinated brown rice, and GABA brown rice with ease. However, it certainly works best with short-grain rice. However, it comes with a hefty price tag, making it a noteworthy upgrade once you have the funds. I. 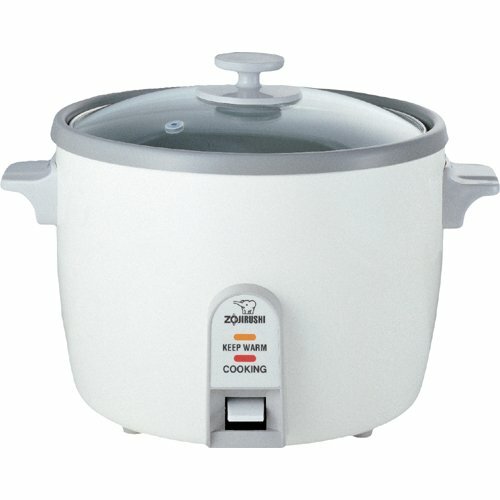 Are Zojirushi Rice Cookers Any Good? Zojirushi rice cookers are among the best in the rice cooker line, alongside other brands such as Panasonic, Hitachi, Tiger, and Tobisha. The company, Zojirushi, consistently manufactures kitchen appliances that come with a wide range of features that can be considered the top of the line. Needless to say, their rice cookers come with the latest cooking innovations to produce high-quality rice meals on the table. 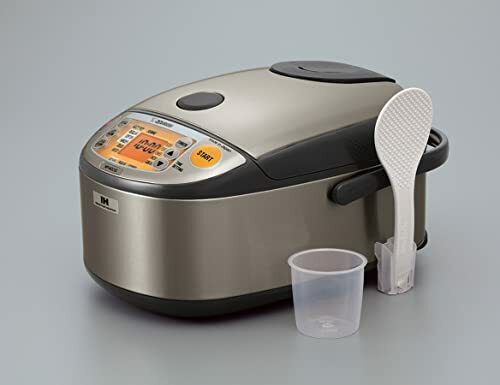 The introduction of induction heating technology has raised the bar when it comes to a rice cooker’s precision and cooking capability. Although typical cookers apply direct heat from the electrical plate which is located below the inner pan, induction-heating cookers, on the other hand, obtain heat through an alternating electric current. 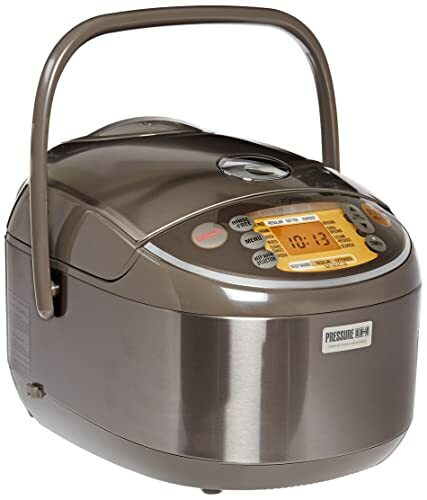 This technology is adapted by Zojirushi and applied on some of their best Zojirushi rice cookers. Due to this, their IH rice cookers can respond quickly and heat faster compared to a non-IH rice cooker. This allows for even precise temperature control. Zojirushi rice cookers are made to last, thanks to their high-quality and durable construction. Using only the finest materials, you can expect them to serve you for many years. Mainly, the pot cover is made of either high-quality plastic or stainless steels. Such materials are capable of withstanding strong impacts, offer excellent insulation, and make way for easy cleaning. Meanwhile, the heater pot is made of strong and durable platinum. It comes with 7 layers of structure and a high-quality ceramic glaze coating to provide superior heat absorption and heat retention capabilities. It also helps ensure the safety of the user. 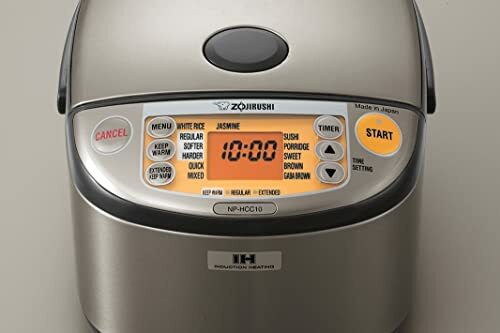 As one of the leading rice cooker manufacturers in the market, Zojirushi made it a point to include a smart design alongside a number of modern utilities and features on their rice cooker products. These include an LCD screen, shield try, removable cover, automatic hygiene mode, and cooking timer mode to name a few. 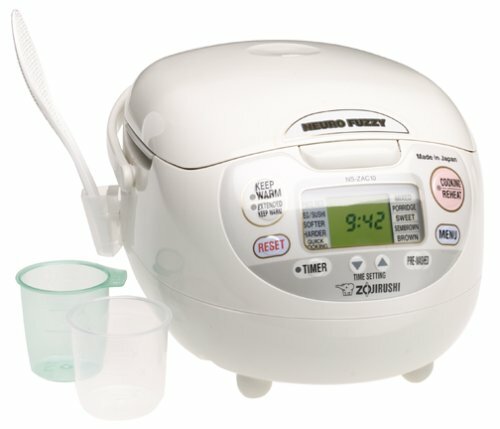 One particular feature of some Zojirushi rice cooker models is the MICOM (microcomputer chip) technology. In case you’re wondering, this technology can significantly improve a rice cooker’s versatility and functionality as it basically introduces various settings for users (more on that later). Also, rice cookers with the MICOM technology can control the cooking temperature automatically, even including the cooking time depending on the amount and type of rice being cooked. This lets you leave the rice cooker to do its job without the need to check it every now and then. Also, MICOM rice cookers are automatically programmed to include steaming and soaking time, you shouldn’t have to re-program it for the various cooking phases. As mentioned earlier, Zojirushi rice cookers, particularly those with the MICOM technology, come with a number of menu settings that offer more healthy options to the user. These settings let you decide what type of cooking you want. There are settings for quick cooking, porridge, GABA brown rice, steel cut oatmeal, sushi rice, and even an umami setting. If you think using Zojirushi rice cookers can lead to high monthly utility bills, then you might want to think again. One of the best things about them is that they actually help you save power by using the inverter technology. With the inverter technology, the cooking temperature will be automatically and precisely adjusted in accordance with the current cooking phase. 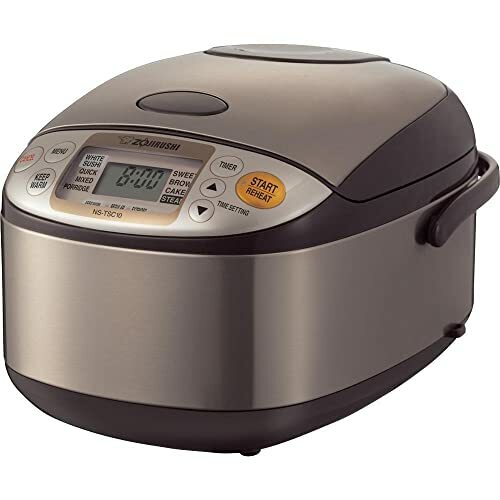 During the soaking phase, the rice cooker will remain at the right temperature in order to maximize absorption. This results in rice that’s neither overcooked nor undercooked. The inverter technology is used in the rice cooker’s heating system, and the system will regulate the level of heat in order to achieve a consistent temperature throughout the cooking cycle. With such technology, you can enjoy an evenly cooked rice – and an even lower monthly electricity bills! Unlike most high-end rice cookers on the market, the best Zojirushi rice cookers are available at very competitive prices. You can easily find the one that suits your budget, and if you have a very tight budget, there are very cheap alternatives as well – although they don’t have the advanced features that the more expensive ones have. Now that we have an overview of the various features that Zojirushi rice cookers have, it’s time to take a look at the top Zojirushi products which we believe are the best in the market. Let’s start. Next comes the NS-ZCC10 cooker which is perfect for those who want to enjoy eating different types of rice. It’s equipped with the Neuro Fuzzy logic technology which monitors the cooking process and automatically adjusts the temperature and cooking time in accordance with various factors. That aside, the NS-ZCC10 comes with menu settings that include porridge, brown rice, white, mixed rice, rinse-free, porridge, sweet, semi-brown, and quick cooking. And since it has a large 5-cup (uncooked) cooking capacity, it can feed around 3-5 people with ease. Needless to say, it’s one of the best Zojirushi rice cookers out there. Apart from the Neuro Fuzzy logic technology which is undoubtedly its best feature, it also has a removable lid which helps cleaning a lot easier. Additionally, it is a digital rice cooker, so you can expect it to be quite advanced. You have the option to set the cooker to either automatic warm, extended warm, and reheat cycle by just pressing one of the buttons. Perhaps the only downside to it is that it might take time to cook the rice – but we do believe good rice will take time, so it shouldn’t be that bad. The NP-HCC18XH is just the larger version of the NP-HCC10XH with the same features. It uses the induction heating technology which is rather quite useful compared to the traditional rice cooking method. In my observation, the two settings in the delay timer option are quite handy. Moreover, its exterior is made of stainless steel, making it quite durable and even suitable for most kitchen aesthetics. The cooker is fairly large, with a capacity of 5.5 cups (uncooked), making it ideal for those with a large family or if you’re expecting some friends to come along. It also has the Keep Warm and Extended Keep Warm functions which are both useful for keeping the rice at the perfect serving temperature at all times. Compared to the previously mentioned cookers, this one only has three cooking options available: GABA brown rice, brown rice, and germinated brown rice. However, as was mentioned earlier, it certainly works best for short-grain white rice. If you’re looking for a fully functional rice cooker on the budget, then the NHS-10 is for you. Available at only around $50, this one’s a no-frills rice cooker that can cook rice in a pretty much straightforward process. The heating plate, which is responsible for heating the inner pot, is located at the bottom of the external vessel. There’s also a thermostat which helps make sure that your rice won’t get overcooked. Once rice is cooked, the thermostat will automatically shut down the heat, prompting the cooker to go into Keep Warm mode. A welcome addition is a steamer which is ideal for steaming vegetables. However, it can also fit in other food, from fish to fruits and even chicken. 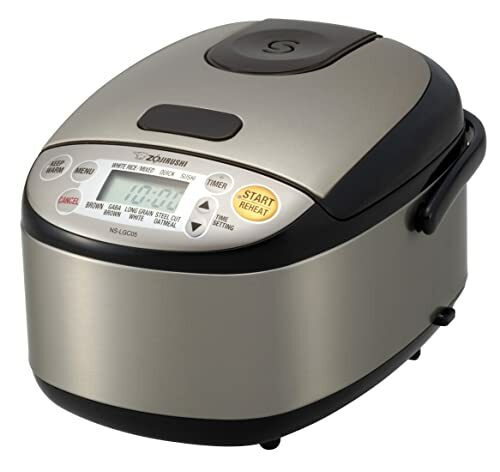 Due to its simple control panel, it certainly is the best Zojirushi rice cooker as far as ease of use is concerned. The NS-LGC05XB Micom rice cooker is the updated model of the popular NS-LAC05XA 3-cup rice cooker. That said, it’s a remarkable rice cooker that comes with a variety of cooking options. We chose it as our top pick for a number of reasons. First, it’s capable of cooking up to 6 different types of rice including brown rice, wild rice, long grain rice, GABA brown rice, white/mixed rice, and sushi rice. It also has special settings for quick cooking and steel cut oatmeal. Second, it has a triple heater design which generates heat from the side, bottom, and lid, allowing quick and even cooking and heating. Lastly, it comes with Zojirushi’s MICOM technology which adjusts cooking item and temperature automatically. The NP-NVC18 is yet another Zojirushi cooker that uses the induction heating system. However, it also comes with an Artificial Intelligence feature which makes can make rice cooking a truly convenient and pleasant experience. It comes with eight different settings including white, sushi rice, mixed, brown, porridge, GABA brown, quick cooking, and even umami. Compared to the previous IH cooker, this one uses pressure for quick and efficient cooking. This results in even fluffier rice as well as perfectly cooked grains. On the other hand, its AI feature automatically adjusts the cooking time and temperature based on the programmed settings and a few other factors. 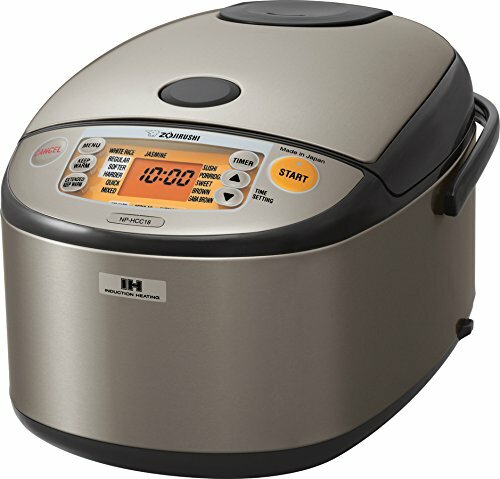 Due to this, it makes the perfect rice cooker for those who eat rice on a regular basis. Unfortunately, it costs way higher than the other Zojirushi rice cookers on this list. But nonetheless, it sure is a welcome upgrade as long as you don’t mind its hefty price tag. Another cooker with the MICOM technology, the NS-TSC10 is fairly large and capable of cooking 5.5 cups of uncooked rice. Apart from its large size, it has the micro computerized fuzzy logic technology for even better and more convenient cooking. It also has the automatic Keep Warm feature to keep your rice warm at all times. The NS-TSC10 has a stainless steel exterior to make sure it’s durable and long-lasting. Aside from that, the cord is easily retractable and the inner surface is made of a nonstick material for easy cleaning. You also have the option to use it for baking cake or even for steaming various foodstuff. Overall, it’s a fairly expensive rice cooker, but its overall performance and features make it a worthwhile investment nonetheless. Last on the list is the NS-WAC18-WD, the largest one we have so far. Basically, it has a large 10-cup capacity, making it the perfect option if you plan to feed several people at the same time. Aside from that, it comes equipped with the Fuzzy Logic technology which is quite handy when it comes to cooking perfect rice. It also has a user-friendly LCD panel with a number of functions available. There’s a total of 7 different cooking options including white, sushi, sweet, porridge, brown, quick cooking, and rinse-free. 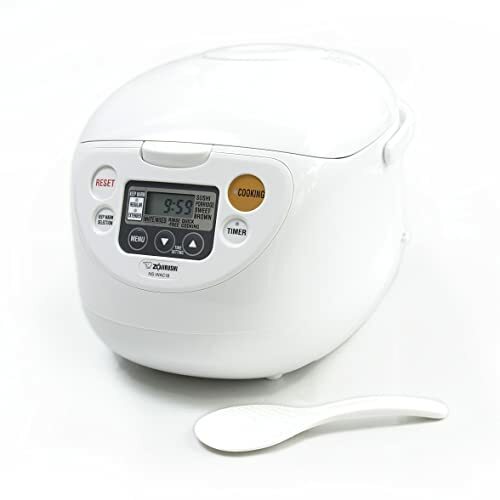 Like the other MICOM rice cookers on this list, this unit is capable of adjusting temperature and time automatically. Despite the many features it comes with, along with its fairly large capacity, you can expect it to be fairly affordable, sitting at only around $100. Zojirushi rice cookers are no doubt among the best in the market. At this point, we hope you now have an idea of which is the best Zojirushi rice cooker for your needs. Just make sure that before you commit to buying, the one you chose could last a lifetime, or at least, for several years. For most, it might be an issue about a rice cooker’s price. However, if you think that the features are more than enough to compensate for the hefty price tag, then go for it. As long as it has all the features you need, then it’s definitely a worthwhile investment.